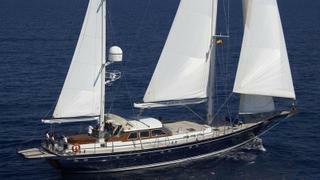 The 31.09 metre sailing yacht Alme Sol has been listed for sale by Manfred Haas at Haas International. Built in steel and aluminium by Dutch yard Jongert, Alme Sol was delivered in 2005 as a Jongert 31T model. A mahogany interior by Peter Sijm comfortably accommodates eight guests in four cabins comprising a master suite, VIP suite, double and twin. All cabins have en suite facilities while a further two cabins sleep four crew aboard this yacht for sale. On deck, the raised helm position aft of the deckhouse permits excellent views of the surrounding areas, while the light-filled deck saloon with panoramic views offers much appreciated protection in chilly weather. Her large decks are great for sunbathing and lounging and the spacious cockpit is ideal for cocktails and al fresco dining. Below deck, Alme Sol is a truly traditional Jongert with a classical and luxurious mahogany interior. A spacious lower saloon with dining area leads aft to the guest area. Forward and completely separated, the crew area of two en suite cabins, galley and crew mess have a separate entrance on deck and direct access to the engine room. All sails are hydraulically furled for easy handling and she features the Jongert patented folding keel that substantially reduces her draft from 4.50 metres to 2.50 metres for easy access to shallow areas. A 330hp Scania diesel engine enables a cruising range of 1,300 nautical miles at 9 knots. Lying in Porto Ercole, Italy, Alme Sol is asking €3,900,000 with VAT paid.